#51 Lego creatoin, war edition! Hello everybody! 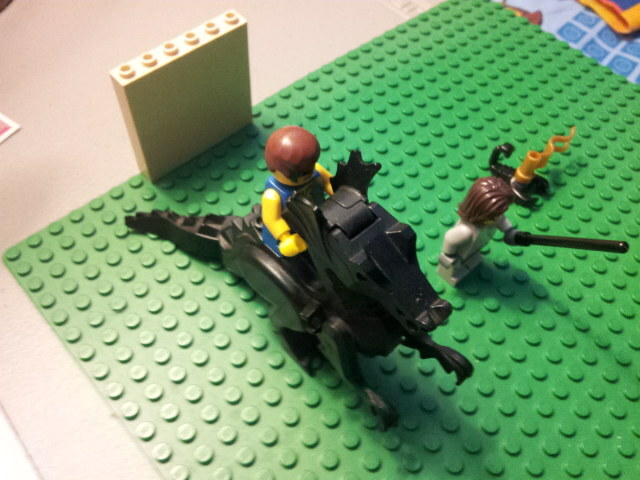 today I’m going to show you what I built, LEGO war themed. Here is team monster. you can tell the different teams apart by looking at the white monster and the black Dragon! each team bids there flag and fights to the end! the winner capures the enemy’s flag! here is team Dragon! team Dragon has a mighty knight and a dragon with fire in its mouth! this is team dragon’s flag! even if team monster defeats team dragon, the scorpian hurts and poison’s team monster! and if that fails, the corpian will run with the flag, sneaky! this is a gas flag, free gas at gas stations in other words. this is a very rare flag and native to team dranster. (only works if team dragon and team monster become one team!) team dranster disbanded five years ago, turning into two enemy teams! 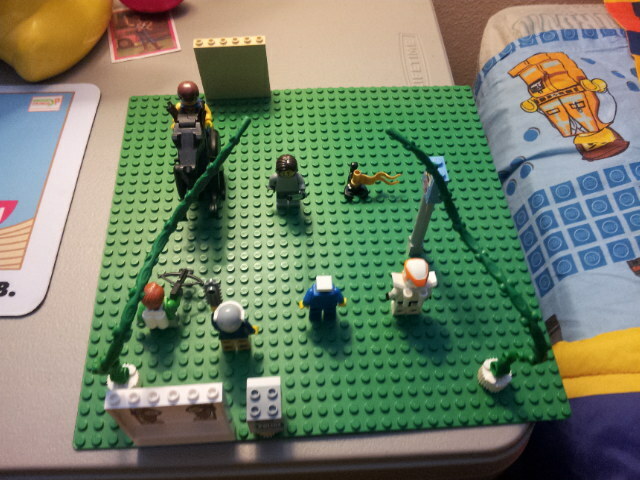 this is the battle field up above! the tentakales are team monster’s portal blocker, because if team dragon goes in there, they’ll lose 5 hp per 1/2 minute why’ll team monster takes no damage! same with the other portal that leads to base, booby trapped! 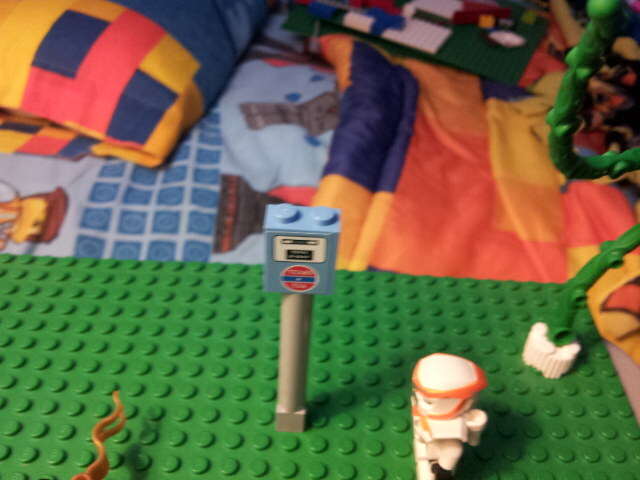 also the mailbox teleports mail to both places, CORRECTLY! well I’ve gotta go but have fun building! #50 Mystery machine! from scooby doo! This is the Mystery Machine! 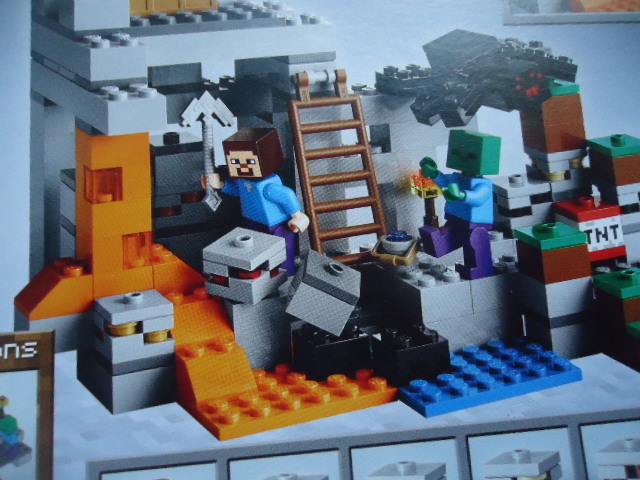 There is a Zombie, scooby, Shaggy, fred, and a plant (or tree) monster in this set! This is the plant monster! but where is the Zombie? found it yet??? It clung on to the plant monster! on the back are some computers controlling the monster! 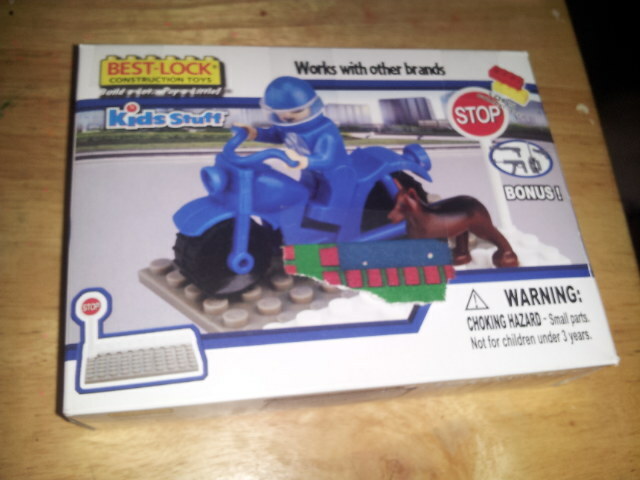 you would never know that enless you got one of these sets! this is the mystery machine in person, out of the box! Fred is holding an actual magnifing glass! 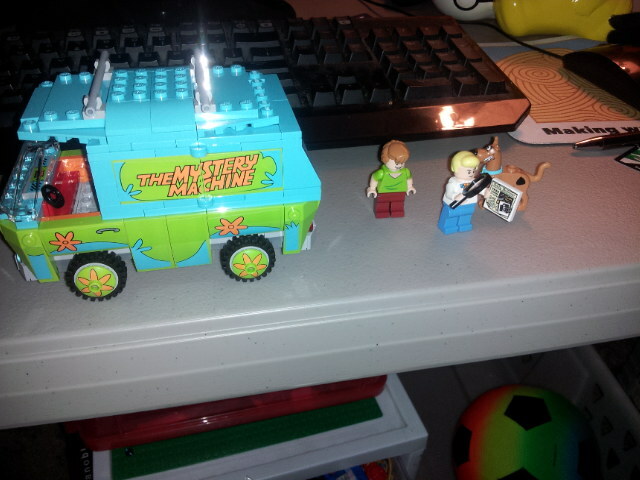 in the mystery machine, there is a lego sandwich, a ton of search supplies and a camera! also you can fit some minifigs in it! 2 in the front and 1-3 in the back! it takes a lot of work to build, plus the fun stickers, so good luck building this! 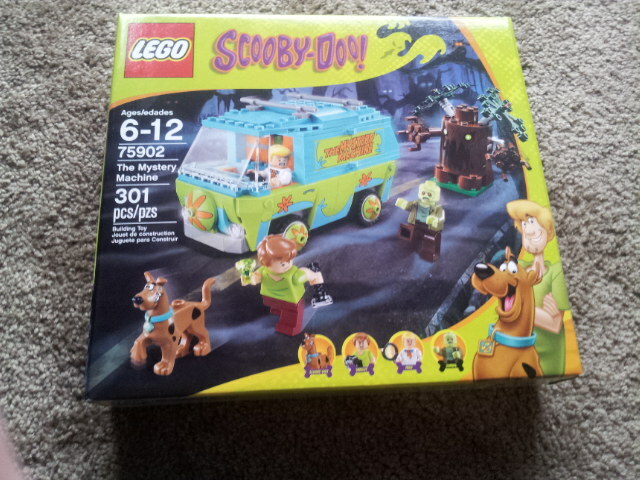 I wonder what other lego sets there are that are themed scooby doo, like the TV seires! I love scooby doo and the series were they stop an evil monster prof. Perricleese goes into! in this series they learn about the 4 elements, water, air, fire and the last one I don’t remember. after solving all the mysterys they move out of Crystal cove and solve more in the next series! I hope you enjoyed the set and I’ve gotta go. but keep posted for you never know when I’ll post next! BYE Bye! #49 best lock cop car! Today I reveiw what I think is a cop and motorcyll! 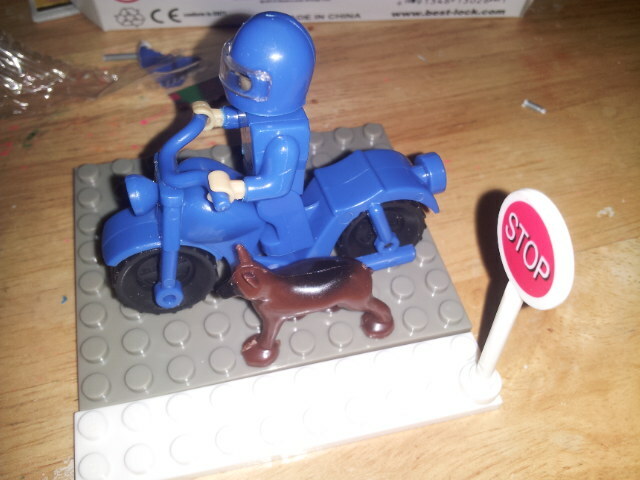 There’s a blue cop riding a blue motorcyll & a brown and black dog! It comes with more but right now I want to talk about the cop. My Stepmom’s favorite TV show is chips, its about two cops who do silly things + can be sereus! this is when it was finished! there’s also a red stop sign! the dog will be hard to put on so I made it so it could fit it in! Not least but not last… GUNS! there is a rocket launcher, a pistol, and a, well I don’t know but my older brother (austin) and timothy are crazy about gun games! I can name gun games they are: call of duty, and sanshro. To be honest, I’m not a huge fan of gun and blood and nife games! I perfer toys and diffent video games! like pokemon for example and playing out side! I love making new friends every day that I play outside! my favorite book series is… nancy drew and the hardy boys! my top book of all time is… Charlie And The Choclate Factory! I like to blog more and more that I blog! well I’ve gotta go, Bye! 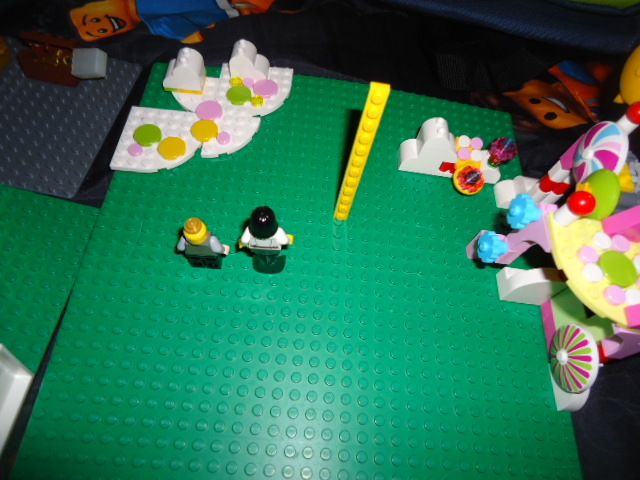 #48 The Lego Movie Set 70817 + Video! 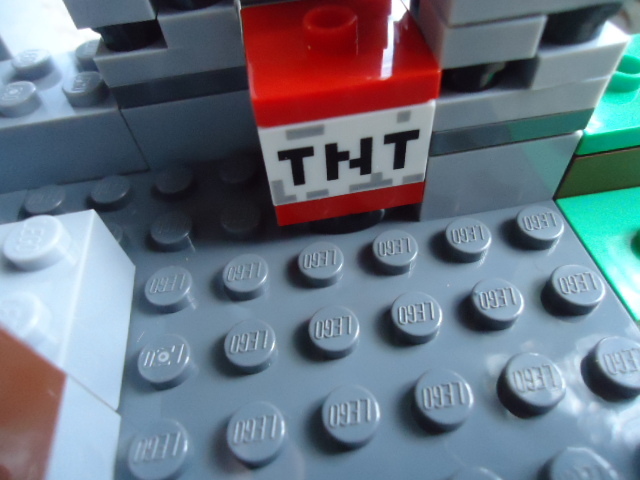 Today I’m going to show you a video of 70817, A LEGO MOVIE SET! for watching and have a good time! welcome back Lego fans! 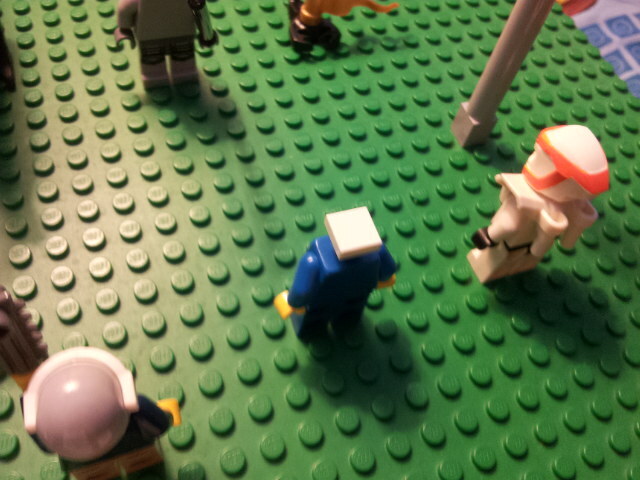 today I’m showing Lego land again but with 2 new zones! zone 1 hase two people. 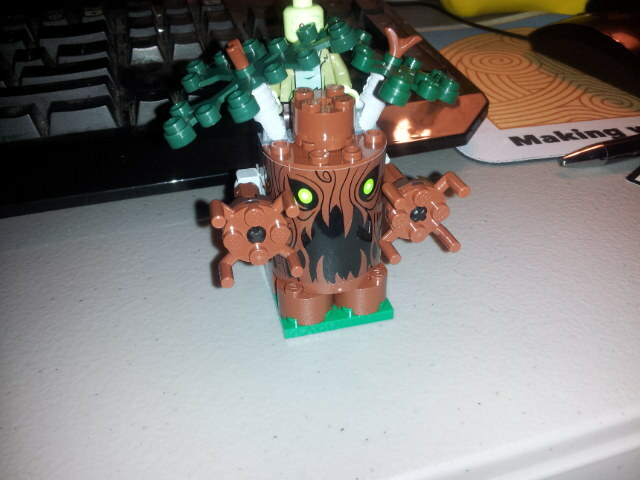 Latley sea pirate has mareid gilly studs and is EVIL! Hi! Lego fans! today if you also like trains, today’s you’re lucky day! This is a 3 in 1 set! 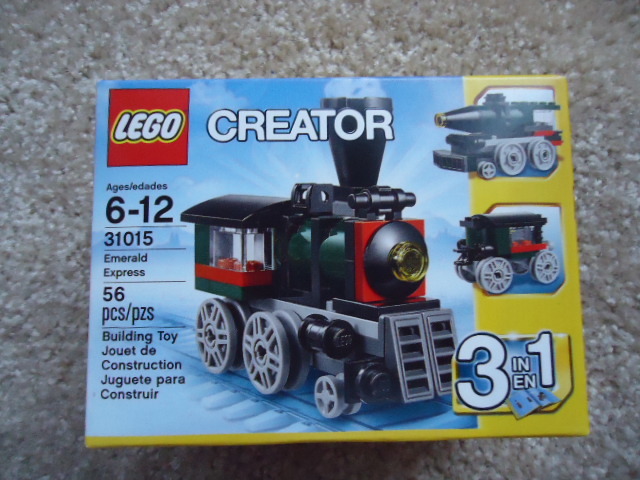 you can build 1 of 3 train parts! the trains connect and can be pulled just by the back or the front! the leading part is my favorite! if you have lego tracks… put the train on them, push it, and the train will move! 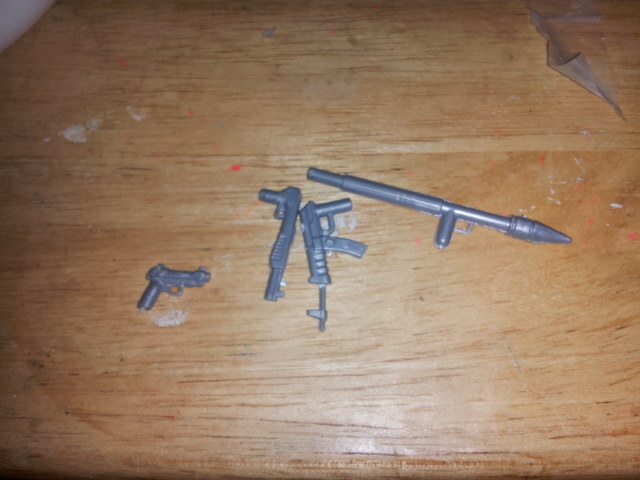 These are the parts you can build… front, carrage, and back! 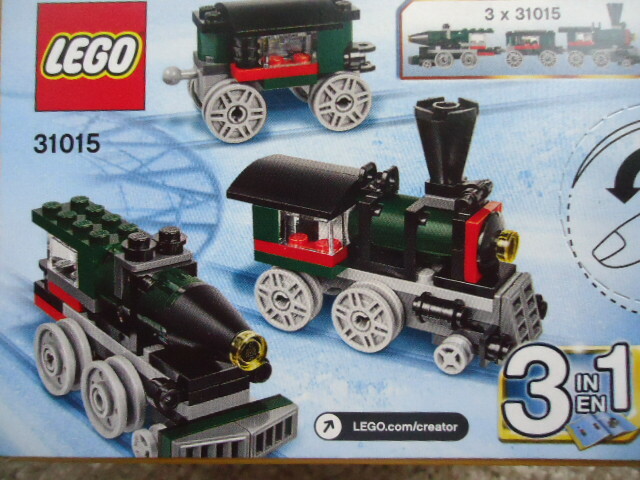 If you like trains and get this set, do first the front! 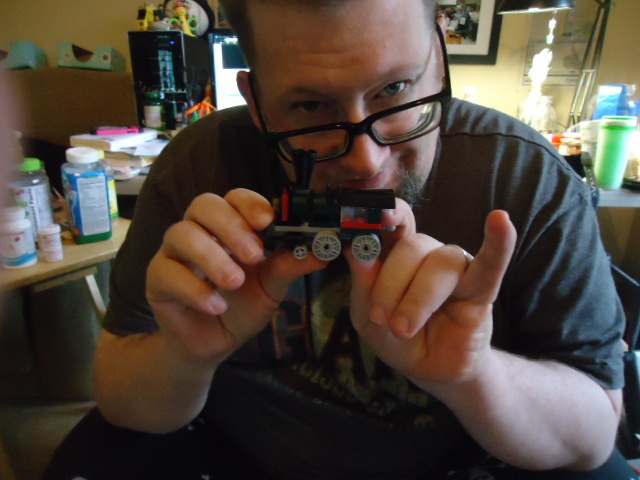 My dad (the ramen rater) is holding the finished train! If you got 3 sets, build all 3 parts! Noodle lovers should also visit http://theramenrater.com! If you like pokemon visit my other website at http://pokemonandy.wordpress.com! Or tap on pokemonandy on the top right corner! So I’ve got 2 more sets after this that will be done next time. If you can terria the game is super famous, also known as the side scroller minecraft! I hilley recemend it! If you like construckshen then you’ll like one of the next 2! If you love the lego movie then you’ll like the other one! Lego minecraft is popular! 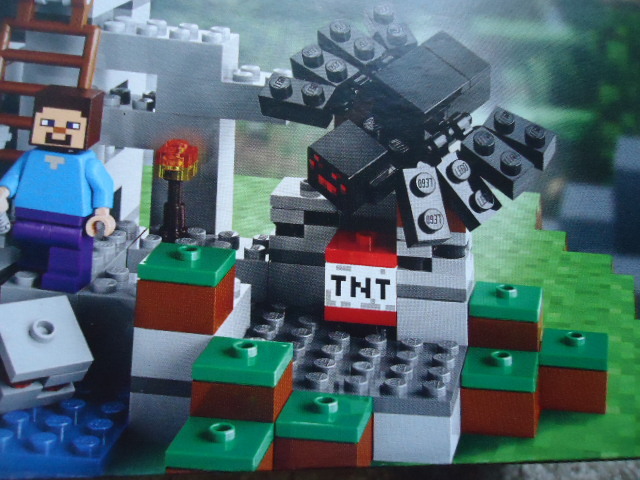 If you love legos and minecraft… then you will love the lego minecraft micros, and normal sized ones, posts #42-#46 have 4 diferent lego minecraft sets! If you like pokemon also visit http://pokemon.com! If you can’t find legos any ware go to the lego store! 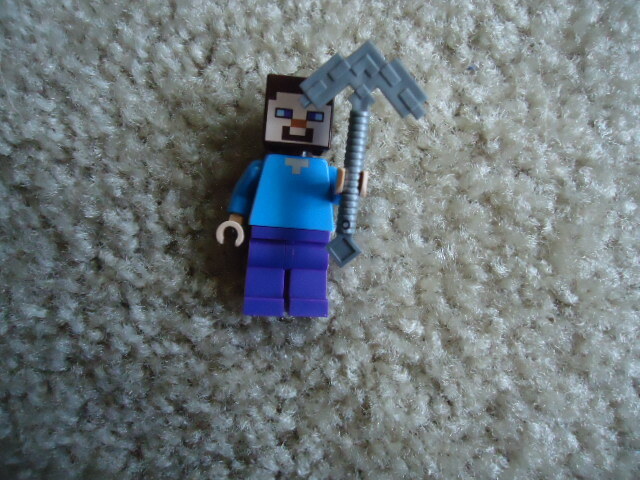 If you can’t find lego minecraft the lego store and target mite have some. Well I have to go lego fans,BYE, BYE! welcome back and today i am going to show you THE CAVE! welcome back Steve! today your going into a cave with zombies and spiders! BRAINS is his game! he eats’em all day! zombies try in minecraft to spawn and kill players! they walk up to your avatar and hit your avatar in tell your avatar dies! stealing armour to wear and to protect it self! minecraft zombies have 20 HP. OH NO! 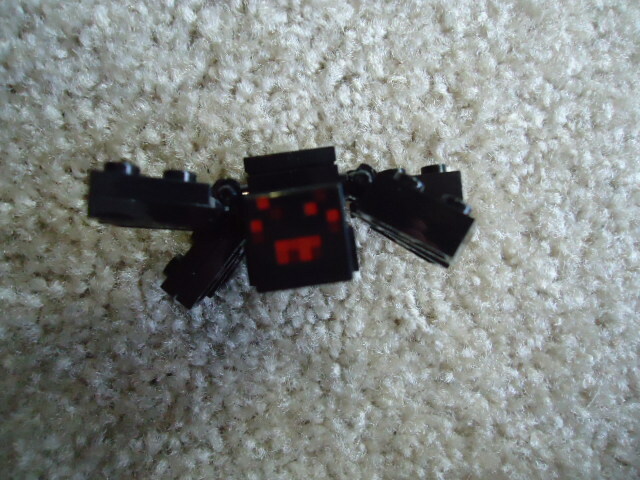 a spider jumps on you to try and damage your avatar in minecraft! these 20 HP monsters carry string and there eyes to collect, helping you brew potions and make a bow and a fishing rod! this set is made for kids 8+, 249 bricks and this is the list of the characters! 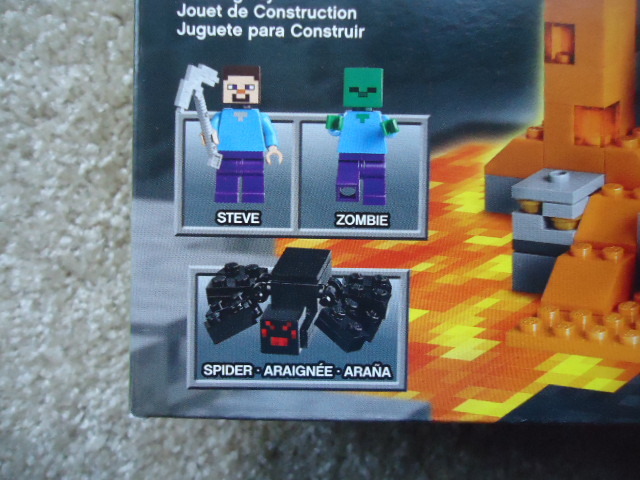 steve (with stone pickaxe), zombie, and spider! RUN FROM THE ZOMBIE! 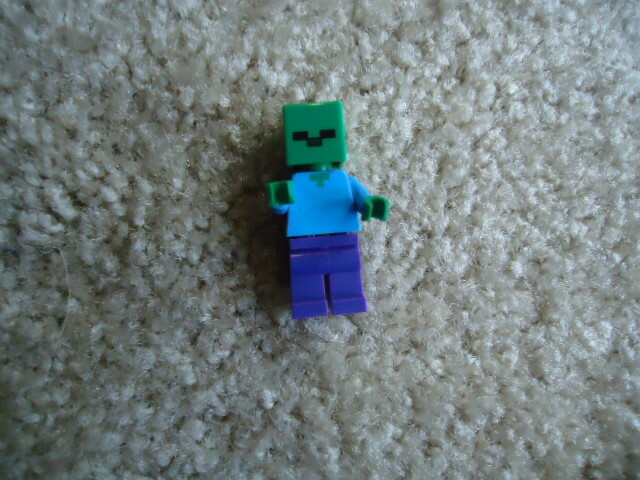 the zombie is trying to eat your brains! so minecraft is the building game from mojang! they build minecraft updates for the game starting in 1990’s! minecraft you use the a, s, d, w, comands to move aruond! so you punch trees for wood, mine dimond for wepons and tools, and you kill mobs for meat! well I’ve gotta go, BYE!